Was is somemthing I said about Shabbat? In Fill the Void, Hadas Yaron played an independent woman who decides to become a conservative Jew. In Maxime Giroux’s Felix and Meira, Yaron does it in reverse, playing an ultra-orthodox Hasidic Jew who finds true love with a godless and aimless hipster. 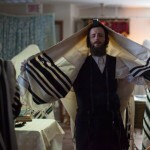 Meira is the extremely unhappy wife of the overbearingly religious Shulem (Luzer Twersky), and they live for religion and rituals in an enclosed community of Hasidic Jews in a snow-battered Montreal. It is a grave and confining community that appears to be locked in a past from decades ago. The floorboards creak and Meira plays records on a phonograph (no Pandora here) when Shulem leaves the apartment for morning prayers (she loses herself in Wendy Rene’s “After Laughter Comes Tears”). Aside from her illicit music and her young daughter, Meira has nothing to be happy about and exudes misery. Giroux and his cinematographer, Sara Mishara, illustrates her airless existence by trapping Meira deep within pools of shadows. Meira can’t break through to the light and her eyes in the dark have a dulled glaze, like an animal trapped in a cave. Felix (Martin Dubreuil) is another lost soul trapped in the darkness. A man with no attachments, he is in town to visit his estranged father, who is dying. When he does die, Felix receives the promise of an inheritance from his sister. But, like Meira, Felix is trapped in his existence, peering out the window of his dank apartment into sunlight that stops dead at his windowsill. Clearly Felix and Meira were meant for each other. They both wander in the clammy snow and the slushy streets of Montreal – a cityscape that is more a reflection of their souls than a real place. Felix runs into Meira at a kosher pizza shop. Meira ignores him but they keep running into each other until finally Felix musters up a line: “Can you give me advice? You’re religious and I don’t know what I am.” From that moment, despite Meira speaking Yiddish and Felix speaking French, love grows and Meira decides to abandon her husband and her orthodox community for Felix. These out-of-kilter tunes have to carry the emotion, since the characters are suffocating and emotionless. Felix, Meira, and Shulem are all stand-ins for characters. They all perform their roles but the characters are at best sketchy. We don’t know much about Meira (how did she come to be married to Shulem in the first place?) or Felix (he just seems to hang around). These are all chamber music relationships. The characters have neither friends nor backstories. Since they are all cyphers, the emotional heft of the love story can only go so far. And that is where Yaron comes in. She can express joy and gloom with a subtle glance. Meira is not permitted to look men in the eye as a married Haisidic woman, so when Felix and Meira have an intimate moment and she does look into Felix’s eye, Yaron’s glance is an expression of celebration and love that cannot be contained. When Meira tries on a pair of jeans, it is a religious experience. But even Yaron’s charisma cannot hold back some of Giroux’s missteps. A travelogue ending is a bit too much. Following a tour of Venice is a crazed detour which has Felix in cheap Hasidic Jew regalia as he attempts to pass through the Hasidic community to seek out Meira. Compared to Felix’s getup, Woody Allen’s transformation into an orthodox rabbi in Take the Money and Run looks like a documentary.